In April of 2018 ShinhanCard signed an MoU with OmiseGO to explore opportunities in fintech and blockchain initiatives. Since then, OmiseGO has been collaborating closely with the company to exchange learnings and increase capacity to adopt blockchain technologies. In January of 2019, that MoU has resulted in a use case that demonstrates a cross-border Proof-of-Concept (PoC) aimed at expanding the ShinhanCard loyalty program internationally and enable borderless interoperability. The demonstration on video is based on a transaction of digital assets of tokenized value that are minted to represent ShinhanCard’s reward point. Shinhan Financial Group is one of the largest banking groups in South Korea in both assets and profit. The ShinhanCard reward point can be used in almost any online and offline merchant in South Korea, and if the card holders of ShinhanCard purchase products in the company’s payment app, called ShinhanPay FAN (Finance and Network), users can receive extra benefits from partner companies of ShinhanCard. In this scenario, FAN points are minted on the blockchain through a smart contract on the Ethereum network, deposited into a Plasma blockchain, and transacted on the Plasma blockchain from the merchant (ShinhanCard) to a user. For this demonstration to test and showcase their PoC, Shinhancard engineers use OmiseGO’s web interface for enterprise developers, which allow basic interactions with the OMG network. The interface mimics the functions of an eWallet suite and allows a developer to grasp the concept of plasma, and make direct, fast transactions. 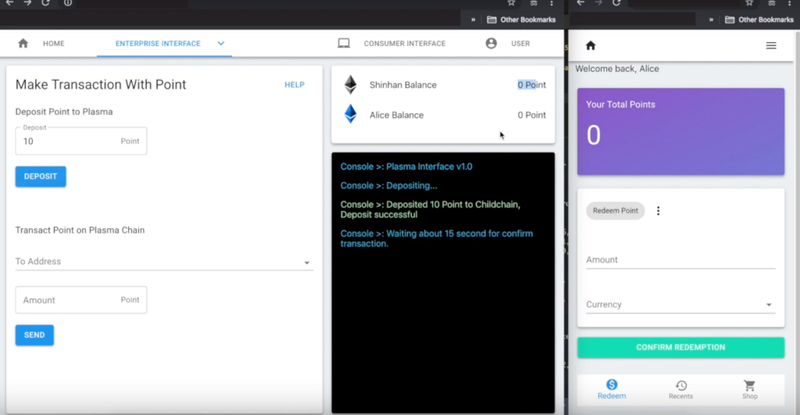 For the purposes of the demonstration, the interface does not include the watcher or exit functions of a plasma blockchain. The eWallet iteration with the watcher and exit functions are relatively new additions which you can learn more about HERE.